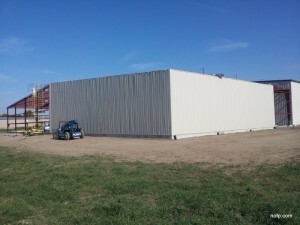 NOFP is a cutting edge manufacturer of high-performace insulation materials, to be used in Wood Frame, Post Frame, and Metal Frame construction as well as in pole barns, dairy barns, horse barns, and equipment barns as well as in residential, commercial, agricultural, municipal, and industrial applications. NOFP’s MicroFoil®, MicroLT™, RigidBoard™, MicroVent™ housewrap reflective foil insulation, and Barrier under slab insulation products can be used alone or in conjunction with other types of insulation to increase the overall efficiency of your structure. The Barrier™, BarrierXT®, BarrierX5®, and XBoard™ product family was specifically designed for use under slab in radiant heated floors for the perfect combination of comfort and energy savings. Our MicroFoil®, MicroLT™, MicroVent™, RigidBoard™, Igloo™, and Premiere™ product lines are the top of the line reflective foil foam insulation products that integrate high quality foil facings and NOFP’s patented self taping seam along with a high insulation core. We take great pride in the design, quality, and service that is required to excel in today’s high paced – “get it done yesterday” green energy savings related business environment. All manufacturing takes place in our Ohio manufacturing plant where we use only American made products in our processes. Whether it’s our Barrier™, BarrierXT, BarrierX5, and XBoard used in under-slab insulation for heated floor projects or, MicroFoil™, MicroLT, Igloo, RigidBoard™, Premiere Duct Wrap, MicroVent™, or Pipe Insulator reflective foil insulation product lines – you can expect to see significant savings and vastly improved comfort levels from all of our family of high-performance insulation materials. We look forward to working with you in the very near future!!! For 30 years, NOFP has been working hard as your single source for high performance reflective foil insulation building products. NOFP's background in foam and insulation has been the cornerstone of providing high quality reflective insulation and flexible under slab concrete insulation for all of your building needs. Whether you are insulating a concrete radiant floor with our Barrier product family or looking to save energy and go "Green" with our reflective foil roll or rigid insulation, NOFP has the right solution for your tough applications. In addition, NOFP is a full service provider of custom protective packaging and lamination services. See how we can help with our decades of packaging design experience. Flexibility, Durability, Sustainability: Solutions made simple. We’re moving into our new 20,000 square foot expansion. The new space will allow for increased on hand inventory levels and increased manufacturing space. Copyright 2019 NOFP INC. All Rights Reserved. Northwestern Ohio Foam Products, Inc.
Email: Information Call Toll Free!